Greetings NSBE DC Family and Friends! 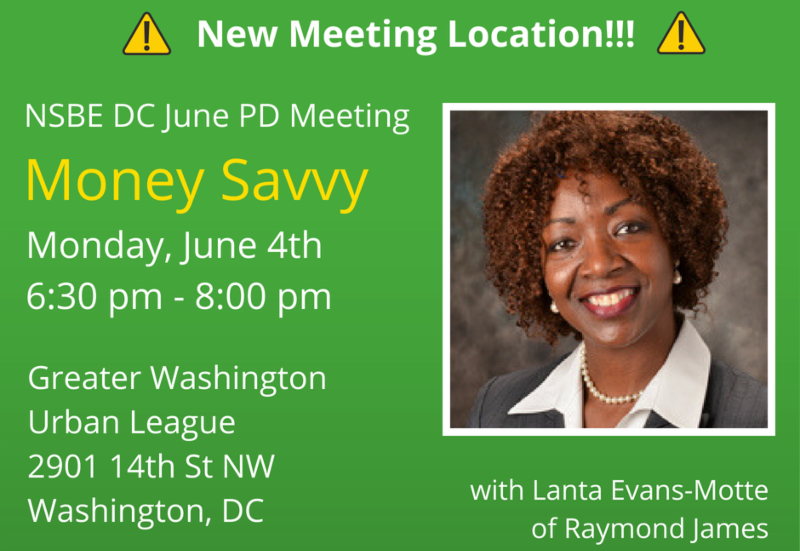 The June Professional Development meeting will be held on Monday, June 4, 2018 at 6:30 PM at the Greater Washington Urban League. Dinner will be served. Free for members, $10 for non-members. The chapter will welcome Lanta Evans-Motte, Financial Advisor at Raymond James to speak with us about "Money Savvy: Smarter Strategies for Building Wealth." IMPORTANT! It is highly suggested to take Metro or Uber/Lyft into the city if you can. Nearest Station is Columbia Heights (Green/Yellow) Street Parking is available after 630 pm and the garage is free if you shop at Target (validation) and $20 if you do not. Afterwards we can head over to a nearby bar to watch the game if anyone is interested!